Following Part I of the cycle camping challenge, we continue with the undertaking of our team that went out to inspect and map out a cycle-camping safari and ended up having so much adventure and fun. 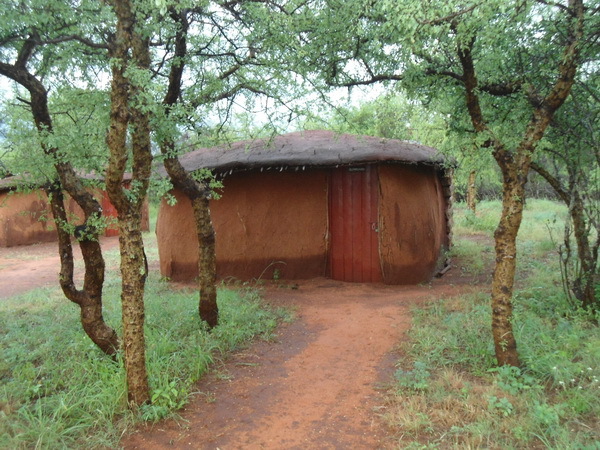 Encountering dead-ends, taking on the challenging terrain, dealing with punctures, going long hours without food, having to do with makeshift accommodation and having to deal with all manner of things, they shared their experience in detail in this blog. Enjoy part II! Darkness was sipping in and the idea of setting camping was inevitable, but the fear of elephants and camping right in the middle of the waters way, made us decide to drive back and night at the nearest town Emali. As we drove back past the point we had got directions from. 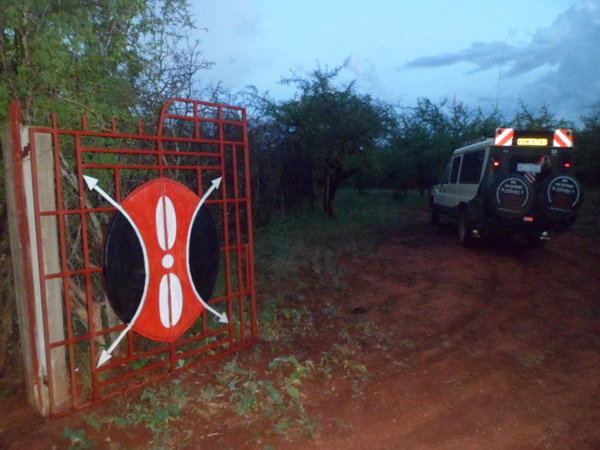 We saw a land-cruiser parked besides some Maasai Manyattas. This was an odd sighting so we decided to poke our noses in to see if we could score something for ourselves. 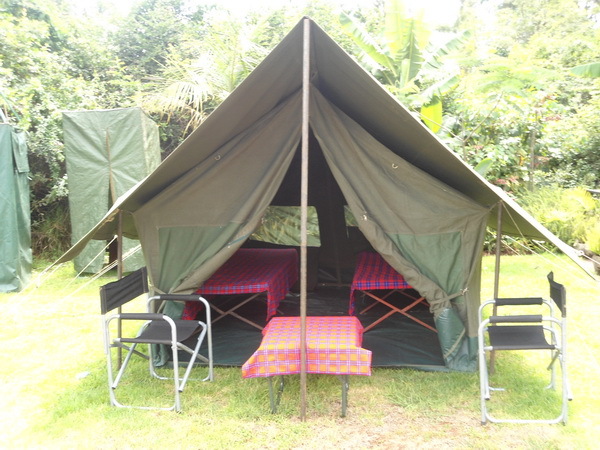 We were amazed to find that this was a camp site, with the rooms built like Maasai homesteads – Muteleu Campsite. We decided to spend the night here. We checked in and immediately Michael transformed into camp chef and quickly started to prepare dinner. 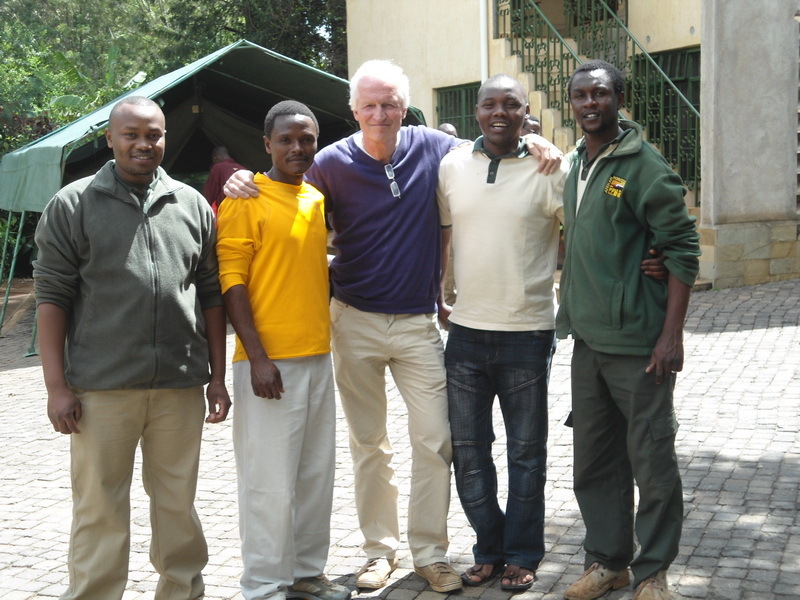 We were lucky to have bought supplies at Msambweni town back in Diani before starting out. We were worried all of the food we had bought at the coast would go to waste… not any more. Dim light from the kerosene lamps only lit up the dark as far as our noses. The smell from the kitchen was tantalizing, and we were quite curious to see what our ‘chef’ was preparing for us. And so just like hungry children we all flocked the kitchen to watch. Unbelievable! He was preparing spaghetti and cabbage stew… egh! I would have sworn the aroma from the cooking area was some form of prime steak and chops with a difficult French name I couldn’t pronounce, or perhaps some Chicken Bianco. Spaghetti and cabbage stew! Strange meal I agree, but the pleasure and speed with which we devoured it, someone watching would be right to think it was the end-of-the-world dinner. After we had licked our plates clean, Frans was rather amused to hear Peter and Eric make requests for a second helping. All the food prepared had been set and served at the table and there was no more left over. Where was more food to come from? 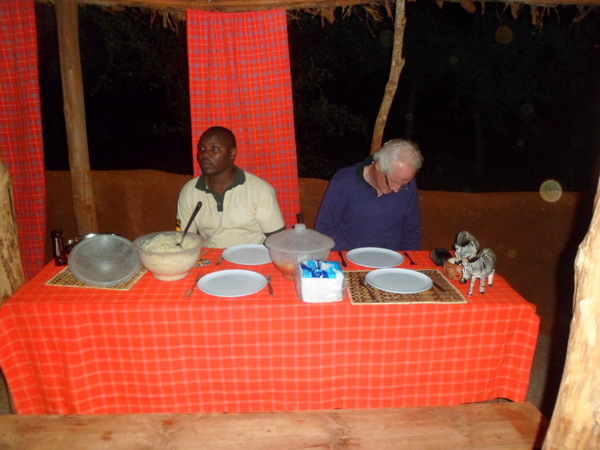 Had Michael anticipated this, he would have rather shopped for some maize meal and made us some ‘ugali’; a Kenyan staple bread-like dish made from maize flour and eaten with vegetables and/ or meats. It would have certainly been more filling than spaghetti. Eric grabbed himself some slices of bread and soda to fill up. Nonetheless, we were grateful; Michael is an excellent camping chef. The night was long and the rain helped soothe us to sleep. As for my roommate (Peter) it was not a very good experience as his part of the room was leaking. He brilliantly hang a polythene bag to catch the water drops and was very proud of his accomplishment. There was a downside to his brilliance though… he had to awake every 2 hours to empty the bag of rainwater. Breakfast was fried eggs, pancakes and bread with tea or coffee. Dessert was fruits (oranges and mangoes). Too cozy for breakfast in the wilderness, we savored every bit of it. After thanking our hosts we checked-out and headed on to navigate the GPS routing. We got new directions from the camp manager which we followed to the latter. 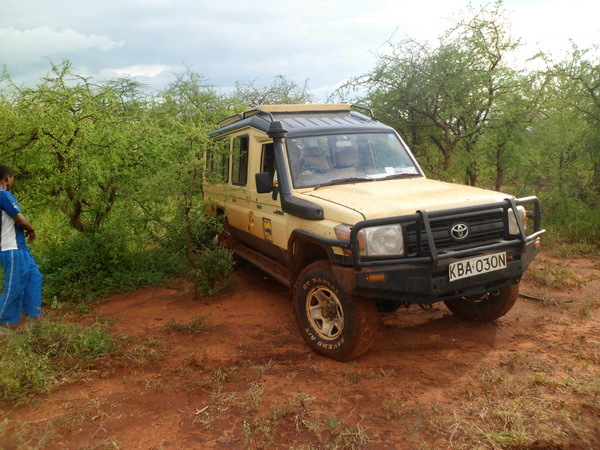 The instructions were simple, when we get to the main tarmac road (have to specify tarmac, as main roads in this area may just be mapped but don’t actually exist), we drive until we reach ‘one shop’ and immediately take a left turn. We were to follow the road till we get to a sign directing to Selegei River. We drove and almost passed the sign without knowing. It had been washed away by floods. We only saw a white plank of wood in the mud and stopped to check… it was the sign. Of course the sign pointed nowhere so we had to ask for directions again. After getting some directions we drove on only to lose our way again since the road was not clearly marked. Lucky for us, someone had trod the path before us. There were tyre marks mapping the way for us. We got to a barrier for Selegei Conservancy and were not let through and we had to turn back; so much effort for nothing! And not without another puncture of course! 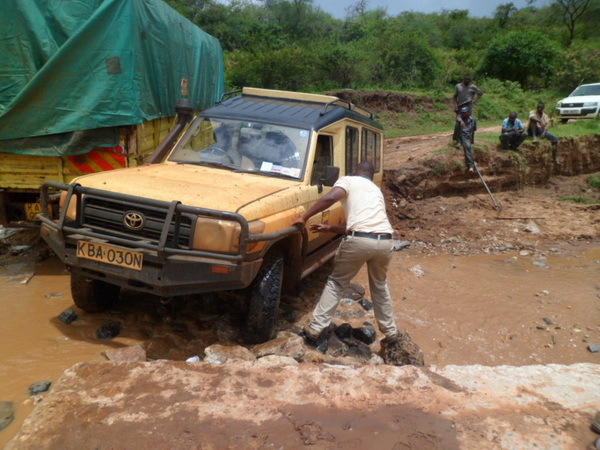 We drove on securing more camp sites along the way. 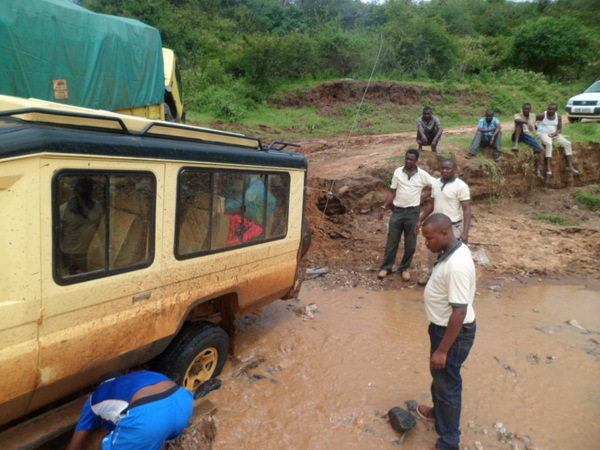 Most of the driving involved off road ‘adventure’, washed away bridges, and helping stuck drivers to get them out of our way. 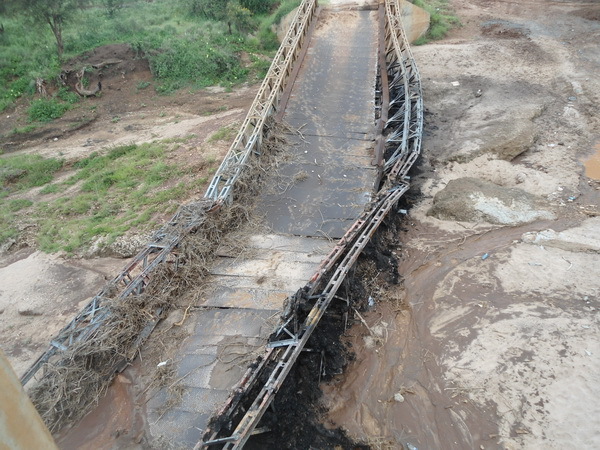 The worst was when we got to a washed away bridge and a truck had broken down on the only passable part of the bridge. We dug and filled a pathway for ourselves with stones. While doing this we had gotten quite an audience. They were crew of the broken down truck and crew of another truck that hadn’t thought of doing this in the first place. When they realized we will actually make it, they sprung to their feet and started helping us. And they consider themselves “masters” of the route. We eventually made it and got to the other side. We drove on until Ngong town where we were ecstatic as this meant we replenish our supplies. We bought some fruits, had our worn out tyres repaired and got new ones while at it. Still hadn’t had any lunch all this time so the fruits were very satisfying. We drove on to a town called Ewaso then the rain started. We had to get to Mai Mahiu town from Ewaso but it rained so hard and we had to find a local guide to help us as the road was full of water. It looked like a river bed. 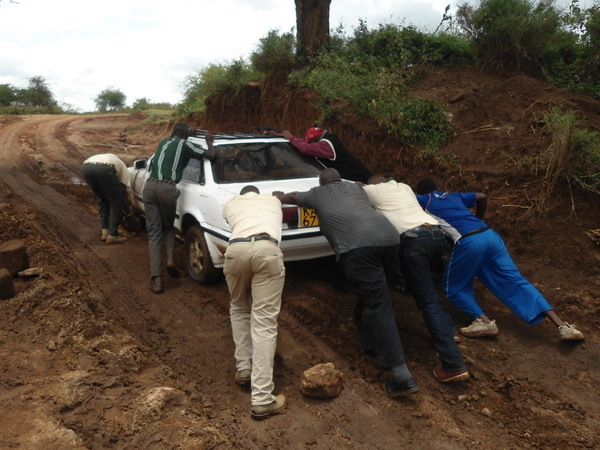 Fortunately there was a lady heading to Mai Mahiu who told us she is very familiar with the roads there. She directed us to a certain road and as we drove on the trusty GPS told us we were going in a circle and were heading back to Ewaso. Along the way we signaled and flagged down a truck and asked for directions. They just laughed at us and told us to follow them as we were back tracking. Finally… Saved by the GPS! 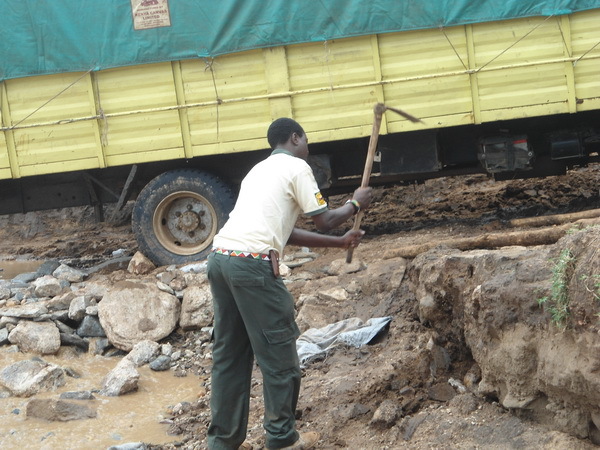 The truck drove a few meters ahead of us, of course clearing any debris that the floods had brought. Even though we were following the truck we kept confirming with the GPS as it had saved us a great deal. We got to the main road and found heavy traffic. The floods had hit across the main road between Mai Mahiu and Suswa and swept away a few small cars. We managed to control traffic until our vehicle made it through and then we left. By this time it was 2200hrs. 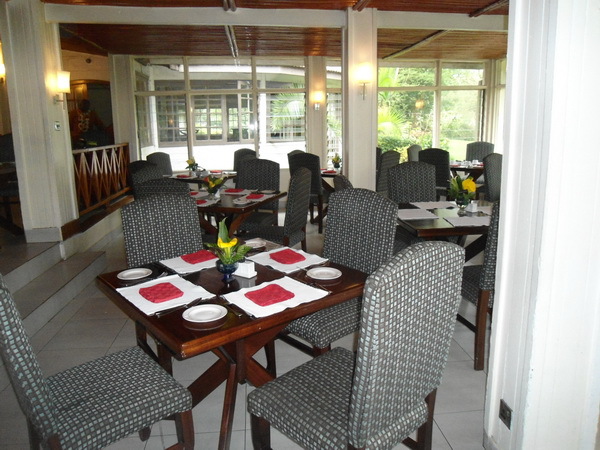 We got to Naivasha and checked into Lake Naivasha Country Club at around 2300hrs and headed straight to the showers. We were starving, and since the kitchen had already closed we arranged to go into town and get some dinner. 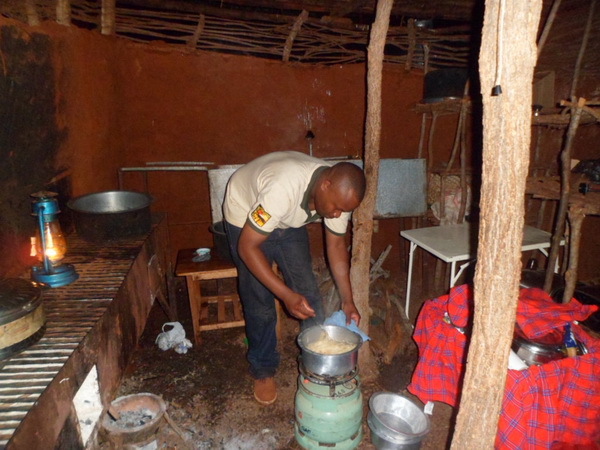 That night was the best night since we left Diani; warm soft beds and no leaking roofs. We did not even hear the heavy rainfall apart from a hippo that snorted right outside our room and I jumped to the window to see what it was. Thank God they don’t know how to open doors. When morning came, we all slept in, we didn’t want to leave those comfy beds. After a late morning breakfast and hotel inspection we headed to Nairobi. Taking with us memories that only remained etched in our minds and hearts. We laughed as we reminded ourselves the funny, the happy and the annoying parts of the challenging safari. 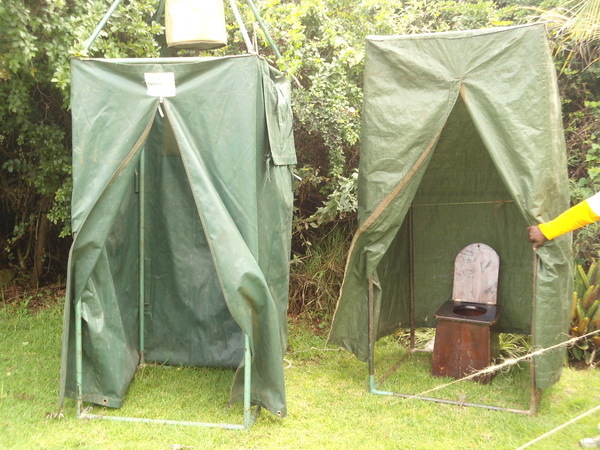 On arriving in Nairobi, we took a detour to see a camp site and tent set-up demo. I must say this whole cycle challenge ended up being quite an experience.